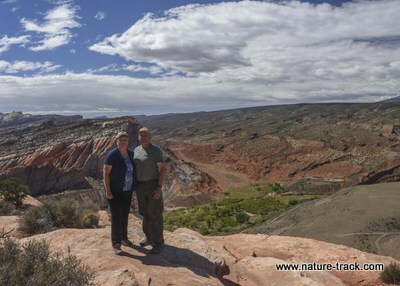 We enjoyed our trip to Capitol Reef National Park so much last year that we decided to repeat it this year. We changed things up a bit though by hiking more trails and by inviting friends, Dean and Vangie Walker, to join us. We spent two weeks in Southern Utah, about half in Capitol Reef and half in Grand Staircase -Escalante National Monument. We were there just a touch later than last year (this year we were there from April 24 through May 6) so the fruit trees at Capitol Reef had already finished blossoming. We had a nice mix of weather though, from cold and almost snowy to sunny and high sixties. Quite similar to last year, actually. And once again, the wildflowers were great. Capitol Reef was the second week of our trip and the park was a little busier than last year when we were there in April. This time we decided to stay in the campground for all six nights. Cathy was anxious about getting a site so we arrived at the campground around 0800 and took the first available site. After watching the comings and goings for nearly a week, it was clear that sites opened up every day and we didn’t need to concern ourselves with whether or not a site would be available despite the fact that the campground was always full by mid-afternoon. We had several days before Dean and Vangie would arrive so we decided to do a little hiking each day. 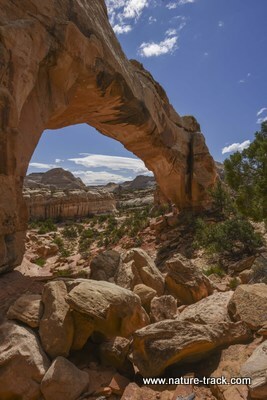 We started with the Hickman Bridge hike, probably the most popular hike in the park. Every afternoon the trailhead parking would be overflowing out onto the road. The difference here is that, unlike in the more popular parks, this is a relatively small parking lot, perhaps 20 spaces. So, it looks a lot more crowded than it really is. This is also the trailhead for another popular hike, the Rim Overlook trail. This trail is longer, about 2.5 miles to the rim overlooking Fruita, and continues on for another 1.5 miles to the Navajo Knobs. This trail also climbs much higher than Hickman Bridge. We hiked this trail on our last day and the overlook is worth the view and I recommend it. 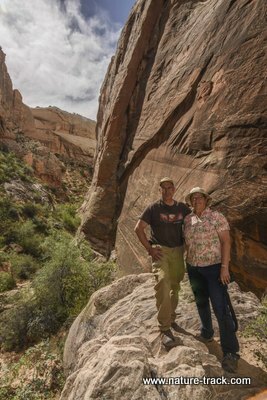 Cathy and I also hiked the short Fremont River trail that starts at campground loop C and goes for about a mile up on the south side of the rim of the river canyon. 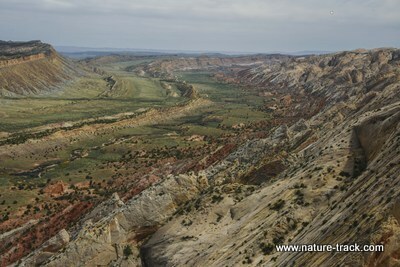 It isn’t a hard hike and provides a great view of the river and of Fruita. When Dean and Vangie arrived, we spent a morning in the north part of the park driving as far as the Temple of the Sun and Temple of the Moon area. We went in the Caineville Wash way on the north end of the loop and came back out the same way. I think this is the better way to get in, especially if there is any chance of rain. The road is good and you don’t have to ford the river. I wish we could have gotten all the way to Cathedral Valley—maybe next time. 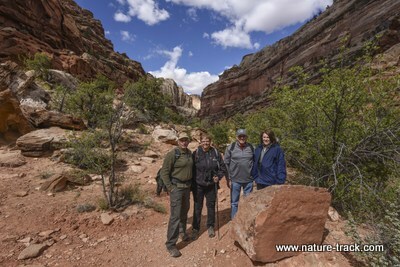 With Dean and Vangie we also walked down Capitol Gorge and up a side trail to the “tanks”. These large washbasin type holes in the rock hold water much of the year and were once used extensively by travelers. The very short trail is easy to find at first, but gets a little tricky once you cross the ravine. It is only a short distance, maybe 50 yards or less, before you need to bear left. If you come to a sandy wash, you have gone too far. 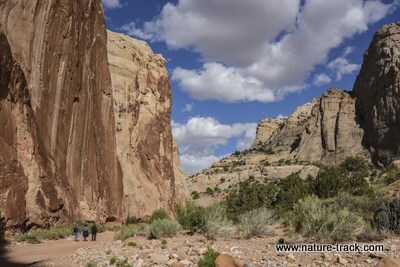 One of the most enjoyable hikes we took was Grand Wash. To be in the shaded bottom walking a sandy trail with red sandstone cliffs towering above was awesome. This trail starts on the Scenic Drive but ends down on the highway. We could have just turned around and walked back (about 1.5 miles), but instead we chose to leave a vehicle at the other end. Timewise, it proved to be about the same as when Dean and I were picking up my truck after the hike we saw a hiker we had been talking to at the far end. He was just leaving, having hiked up the wash back to his car. He was an interesting fellow. He lives in Louisiana but is from Great Britain originally. He has been camping out in National Parks for what sounded like a month or more. 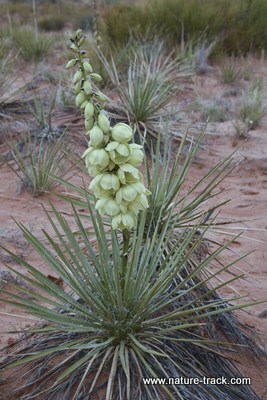 He was more than a little dismayed at the crowds he found in Zion NP even in mid-April. 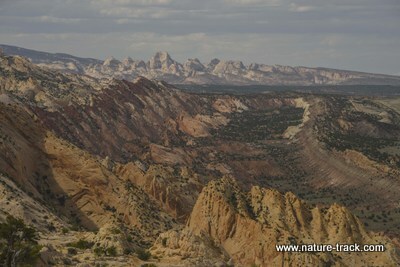 He commented that Capitol Reef was far less crowded (not even in the same league). 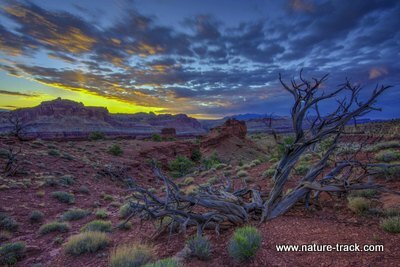 With a British accent he said, “I am camped in an orchard in a place as beautiful as any I have seen in Utah. What’s not to like?” Amen to that. Cell service hasn’t improved in the intervening year and that of course, causes a little frustration. It is lamentable that it is so important but it is a reality in this world where we are now accustomed to instant communication. We found that we could get good service and even WiFi by going to the Wayne County Visitor Center at the junction of highways 12 and 24. It is about 10 miles back toward Torrey from the campground. It is only open from 9-5 though. As for wildlife, as usual there were mule deer in the campground every morning and evening. 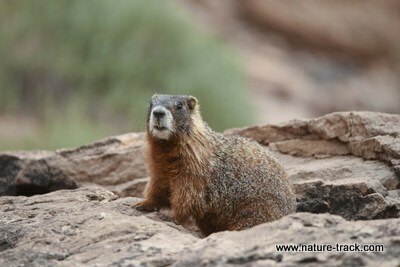 We saw marmots near the CoHab Canyon trailhead. 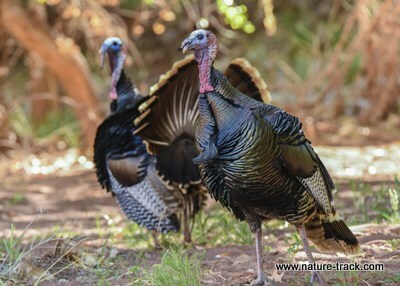 Wild turkeys were really fun and we saw them every morning between the Visitor Center and the Behunin Cabin. Mostly, they were between the Fruita School and the Grand Wash trailhead on Highway 24. There were a number of songbirds but we didn’t see any we didn’t recognize. While we were camped on the Burr Trail the previous week, we ventured into Capitol Reef during a foray to Bullfrog Basin at Lake Powell. From Boulder this is about a two and a half hour drive if you don’t stop. On the way down, we took a very rough road to the trailhead of Upper Muley Twist Canyon. This three mile road really requires high clearance. Four wheel drive is a good idea as well. About halfway in, watch for two arches on the left side of the road. 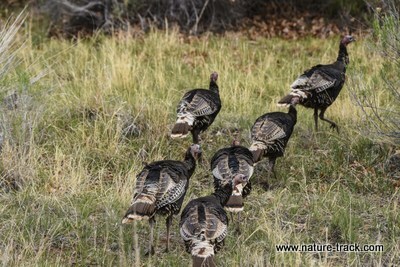 They are hard to see from the road and much more visible by walking toward the canyon wall (about 20 yards). This road is just above the switchbacks over the Waterpocket Fold on the Burr Trail. At the end of the road is the nine mile long Upper Muley Twist trail and also a much shorter, perhaps half a mile, trip out to an overlook of Strike Valley where the Burr Trail runs north to Notom. We looked longingly at the lengthy trail but opted for the shorter one. The views were great, making the bumpy drive and short walk worth it. On the way home from Bullfrog the next day, we stopped at Surprise Canyon which is south of the switchbacks on the Strike Valley side of the Waterpocket Fold. We hiked into this canyon for about 1.5 miles. It was full of wildflowers and eventually closed down to where it looked like a scramble would be required. 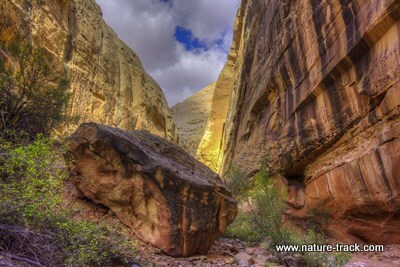 While not really a slot canyon, it certainly became narrow and impressive. We really enjoyed the hike. I would like to go back a little better prepared and without camera and tripod and all the sundries that are required for photography and just enjoy the hike and scramble. 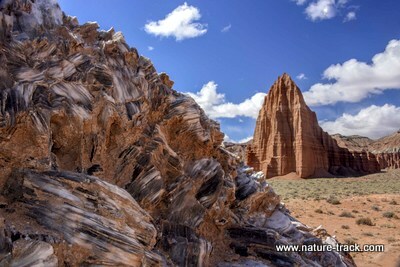 We can’t recommend Capitol Reef highly enough. I do have some angst about writing about this great place as the last thing I want to see is hordes of people there. But heck, I am not sure anyone even reads these blogs so I probably am not doing much damage.